Magic File 2 was sold at select retailers (7-11 branded equivalents) in Japan, along with PPV episodes of the show (episodes released long before, such as the NY case). 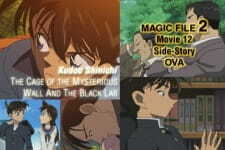 The first disc housed the Movie 12 Side-Story OVA, which features Kudou Shinichi and details a bit of the backstory from the upcoming movie. The second disc was the one with the PPV episodes. As usual with the Magic Files, this one gives you more background story of the respective movie, Full Score of Fear. It tells you about the fight Shinichi and Ran had (which is mentioned in the movie) and the significance of the song 'Amazing grace'. The story centers around Shinichi in his Middle-school and a case he is solving by himself. Whilst investigating, he gets into a fight with Ran because of her superstitions and they stop talking to each other for a week. Of course, Shinichi ends up solving the case. His parents are also featured which I enjoyed very much. I simply love the Kudo family, they are so funny and do not appear enough in my opinion. Though I know this isn't canon material I still enjoy seeing what Shinichi was like before his transformation to Conan. The art is somewhat strange to look at but overall a nice magic file for the fans of DC.